conveyance of energy, as of heat, sound, or electricity. aberrant ventricular conduction the temporary abnormal intraventricular conduction of supraventricular impulses; called also ventricular aberration. aerial conduction (air conduction) conduction of sound waves to the organ of hearing in the inner ear through the air. 1. forward conduction of impulses through a nerve. 2. in the heart, conduction of impulses from atria to ventricles. 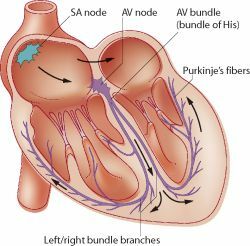 atrioventricular conduction (AV conduction) the conduction of atrial impulses through the atrioventricular node and the His-Purkinje system to the ventricles. bone conduction conduction of sound waves to the inner ear through the bones of the skull. concealed conduction conduction that is not seen on the surface electrocardiogram but may be detected by its effect on subsequent impulses; common examples are the incomplete penetration of the AV junction during atrial fibrillation, the Wenckebach type penetration during atrial flutter, and the retrograde incomplete penetration following ventricular ectopic beats. decremental conduction a gradual decrease in the stimuli and response along a pathway of conduction; it occurs in nerve fibers with reduced membrane potentials. retrograde conduction transmission of a cardiac impulse backward in the ventricular to atrial direction; particularly, conduction from the atrioventricular node into the atria. 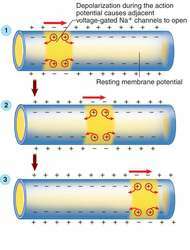 saltatory conduction the rapid passage of an electric potential between the nodes of ranvier in myelinated nerve fibers, rather than along the full length of the membrane. 1. The act of transmitting or conveying certain forms of energy, such as heat, sound, or electricity, from one point to another, without evident movement in the conducting body. 2. The transmission of stimuli of various sorts by living protoplasm. aberrant conduction cardiac conduction through pathways not normally conducting cardiac impulses, particularly through ventricular tissue. aerotympanal conduction conduction of sound waves to the ear through the air and the tympanum. air conduction conduction of sound waves to the inner ear through the external auditory canal and middle ear. anterograde conduction transmission of a cardiac impulse in the normal direction, from the sinus node to the ventricles, particularly forward conduction through the atrioventricular node. Diagrammatic view of the conducting system of the heart, showing anterograde conduction of the cardiac impulse. concealed conduction incomplete penetration of a propagating impulse through the cardiac conducting system such that electrocardiograms reveal no evidence of transmission but the behavior of one or more subsequent impulses is somehow affected. concealed retrograde conduction retrograde conduction blocked in the atrioventricular node; it does not produce an extra P wave but leaves the node refractory to the next normal sinus beat. decremental conduction delay or failure of propagation of an impulse in the atrioventricular node resulting from progressive decrease in the rate of the rise and amplitude of the action potential as it spreads through the node. retrograde conduction transmission of a cardiac impulse backward in the ventricular to atrial direction, particularly conduction from the atrioventricular node into the atria. saltatory conduction the passage of a potential from node to node of a nerve fiber, rather than along the membrane. 1 (in physics) a process in which heat is transferred from one substance to another because of a difference in temperature; a process (often electrical) in which energy is transmitted through a conductor. 2 (in physiology) the process by which a nerve impulse is transmitted. conductive, adj. Cardiac pacing The passage of an electrical charge; the active propagation of a depolarization wave in the heart Physiology The transmission of nerve impulses. See Retrograde conduction. 3. The process by which a nerve impulse is transmitted. the transmission of an electrical current by a conductor. Transmitting or conveying energy, from one point to another, without evident movement in conducting body. n the carrying of sound waves, heat, light, nerve impulses, and electricity. n the process of transmitting sound waves to the cochlea by way of the outer and middle ear. In normal hearing, practically all sounds are transmitted in this way, except those of the hearer's own voice, which are transmitted partly by bone conduction. n the transmission of sound waves or vibrations to the cochlea by way of the bones of the cranium. n the conduction of an impulse along the nerve fiber, accompanied by an alteration of the electrical potential of the fiber tissue and an exchange of electrolytes across the nerve fiber membrane. conveyance of energy, as of heat, sound or electricity. permits a sinus impulse from the atria to ventricles to precede that carried by the normal atrioventricular conduction system. Arrhythmia results, the particular electrocardiographic characteristics depending on the pathway(s) involved. See also wolff-parkinson-white syndrome. conduction of sound waves to the organ of hearing through the air. local anesthesia produced by the injection of an anesthetic agent close to a nerve in order to prevent transmission of nerve impulses along it. conduction of sound waves to the inner ear through the bones of the skull. abnormalities in the conduction pathways of the heart. 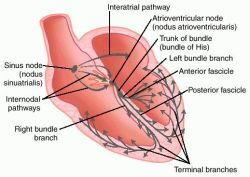 the system comprises the sinoatrial and atrioventricular nodes, atrioventricular bundle and Purkinje fibers. an indicator of a peripheral nerve's ability to carry an impulse; measured during electromyography. A nerve that has undergone Wallerian degeneration is unable to carry an impulse. Severe loss of myelin results in a prolonged conduction time. Digoxin also activates the parasympathetic nervous system, which slows the sinus node and inhibits AV conduction. It is therefore crucial that in all suspected cases of TC accompanied by acquired LQTS and extreme prolongation of the QTc interval that factors exacerbating QTc interval prolongation and AV conduction disturbance are minimized. For example there are PMKs that can activate some algorithms for the treatment of neuromediated cardioinhibitory syncope (for example the function RDR--Rate Drop Response) or to look for the spontaneous AV conduction in order to decrease the percentage of right ventricular pacing (Medtronic MVP Minimal Ventricular Pacing). The patient's AV conduction can fully be documented through detailed event recordings and intracardiac EGMs (IEGMs). In Ablate and Pace Trial (APT) (5), radiofrequency catheter ablation of the AV conduction system and permanent pacemaker implantation were associated with significant improvement of overall quality of life in patients with AF who remained highly symptomatic despite standard medical therapy. Study Will Look Into the Evolution Of AV Conduction Disorders in Pacemaker Patients. This is determined by the native AV conduction time and the sensed AV delay. only when normal AV conduction does not occur or occurs too slowly, causing blocks in the heart's natural electrical pathway (AV blocks). This was not the problem in the current case due to the transition from preexcitation to normal AV conduction in sinus rhythm. There is a full suite of AV conduction diagnostics, including automatically stored electrograms (EGMs). In addition, it provides information about sensing, mode switches, AV conduction trends, and system integrity data such as elective replacement and lead condition.